Thrills and gratitude and coat number 3! Yesterday was a day of some significance for us as we began the final coat of internal render. As with all our coats of render, we're going with Frank's recipes. Recipe for the third internal clay layer is 3 parts of washed sand, 1 part clay, mix with water to thick gravy consistency. And wowee how easily layer number 3 goes on! We felt a little bit of trepidation approaching this third and final coat. With the previous two coats it felt like there was some scope to be a bit rough and ready, as we knew there was always going to be another layer to cover our sins. But now, with layer number three, this is it. There is nowhere to hide. Luckily the render glides on like icing. I think I may have used the icing analogy before. But let it be known that layer three is even more like icing than layer two. Oh sweet relief. We powered along and got half the inside rendered in just one afternoon. 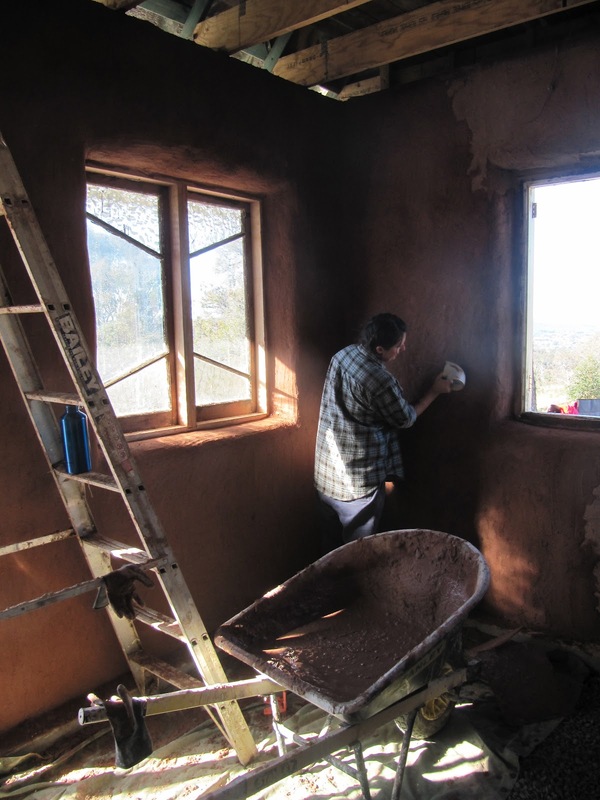 Annie had been inspired to try a little bit of burnishing, uber-inspired as she has been by reading the Cob Builders Handbook. In it, Becky Bee suggests rubbing a large flat, smooth stone across the semi-dry final layer in order to smooth it out and assist the clay molecules to align, making it more durable. We're rather lacking the large, flat, smooth stones on our block, being more of the prehistoric granite outcrop that it is. And so, on Annie's mum's excellent suggestion, we used the discarded elbow of some recycled pipe. It worked a treat. Having said that, we're not so fussed about having super-smooth walls preferring a more handmade quality to our little, tiny house. We're aiming to finish this final layer on Friday when we have the hours between 9 and 3 sans children. Oh but we have little choice but to finish it the inside walls this week as we're planning on making our floor this Sunday and we don't know how long it'll take to dry. We figure we can catch up on some outside business while our beautiful rammed earth floor is curing. We're pretty excited about our rammed earth floor working bee this Sunday. We've got a big pile of clay soil, we've almost got the blood and our special natural sealant aka. Bermagui blend is on its way to us. But more on this at a later time. Sunday also provided a little bit of a thrill when we discovered nine little bubba eucalypts rising of-their-own-accord from our degraded ex-dairy farming land. It's such a wonderful thing to observe these moments of natural bush regeneration and so we resolved to help it along and start a little regen project in and amongst these little trees, which surround a colossus of a eucalypt. It's a little spot perfect for Winter's day picnics with sun shining down from the north and views down the valley. The day ended in a rendering frenzy in fading light as I rushed to finish the final barrow load before the light entirely disappeared and before the kids, through tiredness and hunger, lost it completely. Luckily our neighbour across the hill provided some intrigue in the form of "burning off". Yes I know, who burns off these days? Hmm well plenty of farming types around Bega it seems. Oscar watched from our most coveted spot, the front step. This front step is going to see some action, so warm and sunny it is on these cold cold days. Turns out that the lady at the ABC who made the really sweet video of Olive during the last school holidays is also a fan of our blog, and asked us to write a guest post for the local ABC Open blog. How fun! It was published today, so you can go and have a peek. It's a bit of a "back story" about us and our move, I suppose, a bit about why we chose Bega, and why we decided on this crazy house-building shenanigans, too. For weeks now the kids have been asking us "when can we go up in the loft?". Our answer is usually something like "Ah.. you can go up there when there's a floor for you to stand on". When we originally thought about our loft, we only vaguely thought about what we might use as flooring in that space. As anyone who's ever looked into it will know, second-hand flooring timber is extraordinarily expensive (around $120/square metre is kinda cheap). Hardwood pallet timber was a front-runner for a while, but then we realised that the lengths would be too short for our purposes. You see, because the joists for our floor are also the bottom chords of our roof trusses, they're spaced at roof truss spacing (600mm) rather than flooring joist spacing (400mm). What this means is that normal flooring timber isn't thick enough to span the distance between its supports. At the time we realised this we had other things on our plate (like making sure all our strawbales didn't get wet and rot) so not a huge amount of energy was expended stressing about this particular issue. Then one day I was talking to a dude who was picking up a window we'd given away on freecycle. He was headed off to meet a local builder who's got a little sideline business selling second-hand building material. I thought it was worth a peek, so I went along for the ride. Lo and behold, in the middle of all the timber, was a stack of old warehouse floorboards, about an inch thick and rough as guts. I bought the lot, and today, sitting in our little loft, I felt pretty bloody glad I did. After Pepe's awesome de-nailing job, all that was left was for Brett and I to sand them and fix them in place. We used electric belt sanders and were done in about half an hour. Because of the age, the thickness and the second-hand-hardwood-ness of the boards, we had to pre-drill all the nail holes, but this was really easy and made the nailing-in an absolute breeze! I can definitely understand though, why many many builders flat out refuse to use second-hand hardwood. It's hard! The loft doesn't go all the way across the roof space (not enough timber available) so there's a railing at the end, made out of some old hardwood out of my stockpile and the decorative metal bit out of an old screen door I got off a council clean-up about 6 years ago. old screen door and really-hard-hardwood railing (the space to the right is for our "built in wardrobe", which will be a set of shelves). Destination of the remaining strawbales is as yet undecided. I'm inclined to keep them just for atmosphere. I'm chuffed with it. And the kids are too! It's a super-cosy little space, perfect for reading and snuggling and sleeping, with a pretty special view of the eastern valley for sunrise-inspection. The boards are really beautiful. The time we spent sanding and nailing them meant that we got to have a really good look at all the cracks and knots and nail-holes and patterns in the timber. It's almost a shame they're going to be covered by our bed! They'll be finished with a timer oil called Bermagui Blend, which is a mix of linseed oil, citrus extract and beeswax, and is the same sealant we're using on our earth floor. It smells delicious and I can't wait to use it. Also on the agenda this weekend has been: bulb- and blueberry bush- planting on the dam wall with Nanny and Jaije; putting in the bucket drain and pipe, bedding it out with sand and filling in Pepe's immaculate trench; doing some more erosion control on the batter wall behind the house - thanks Jaije! ; fixing up downpipes (again); climbing the wood-pile and hanging out with the cows and chooks at our current home. and tomorrow, surprise surprise, we'll be doing some rendering. This week we are lucky enough to have Pearl's dad, John (aka 'Pepe' or 'Peps') staying with us, toiling dutifully on our little house during the day, and washing our dishes and patting Cuddles the cat by the fire in the evening. It's been quite phenomenal to have him contributing to our home (again - he was at our workshop, too). I LOVE seeing the way different people work on things, what they're good at, how they face challenges and think through problems, and I LOVE that our home is being made by so many different hands! Peps is quite the perfectionist. He likes taking his time, doing things properly and thinking things through thoroughly before he undertakes a particular task. I'm a little lacking in all of these fields, so I quite enjoy having a bit of the 'thorough' (as opposed to the 'gung ho') vibe on the worksite. It's also been amazingly calming for me, knowing that things are happening on our land during the day, when I'm at work. Most of the time I'm at work I'm more than a little bit antsy, unable to stop thinking about all the things that aren't getting done on the house while I'm spending my time writing grant applications and thinking up creative ways to get kids involved in re-using crap from the tip. So what exactly has our Peps been up to? He thoroughly cleaned out all the loose straw and clay and general crap that had accumulated inside our little house over the last 9 weeks (I can't believe it's only been 9 weeks!). It was important to do this so that there was no potential for decomposition under the earth floor, which could potentially lead to 'sinking' sections of the floor, which would contribute to cracking. This was a pretty immense job and, in true Pepe style, he went above and beyond the initial call of duty, excavating some of the accumulated inside clay seeking out little hidden pockets of buried straw. Yeah! When this was done, he single-handedly wheelbarrowed in all of the gravel for the base layer for our rammed earth floor. No easy feat given that gravel, I have learned, is a pain in the arse to shovel. So we were more than a bit grateful for help in this regard. The gravel under the floor acts to stop any moisture that may seep in under the footings from creeping, via what's known as 'capillary action', up to the rammed earth. Because of the large air gaps left between the gravel pieces, moisture is unable to capillary up, which it could potentially do if it was just earth on earth, creating a damp floor - not really the look we're going for. Then, he dug a lovely trench to drain any water that may collect in front of our water tank. This will have a bucket drain attached to it (yes, I will post a picture when it's done - very interesting if you're a drainage dork). Our plan is to drain this water into a little pond in the veggie garden, which will provide habitat for frogs and lizards and birds and give us a spot to grow things like lemongrass, which dig being next to water. Then he pointed out the totally spectacular sunset (we hadn't seen it because we were all huddled in front of the fire and/or busy cooking dinner and/or attending to children). Then he did a spot of rendering, and today he lovingly de-nailed all the second-hand warehouse floorboards we scored for our loft. If it was up to me, I'd probably just skip this step. De-nailing? I know it's probably a good idea, but I just don't have the time or the patience to do a job like that. So thank goodness for the Peps and his attention-to-detail ways! Now that winter is here I find that some mornings, as we drive up to our land, I feel like I am in the mountains of southern Mexico again. If I squint and ignore the eucalypts I am transported to those mountains where the the roads were dirt, the clouds hung low and the air was cold. I was there in early 2003, winter time. Like many good left wingers I had decided to spend some time with a Zapatista community and found myself in the community of Oventik in the mountains near San Cristobal de las Casas in Chiapas, southern Mexico. With a handful of well-intentioned westerners I was there learning Spanish. A program had been established whereby relatively rich whiteys could live in the community and learn Spanish and Mexican history, with the money we paid going towards the autonomous school that had been established for the kids of the community. We slept in a wooden hut with a dirt floor. It got down to zero degrees inside the hut over night so we slept in a beanie and our clothes. It rained and rained and rained and we ate a lot of black beans, tortillas, avocado and lime. It was a good time. And yes it was a time before children. When I see that morning fog and feel the cold air I do find myself yearning for those black beans and tortillas again. And while I've not embarked on so many life-changing-across-the seas adventures since the kids came along, this house-building adventure of ours feels like a pretty big one, pretty life-changing at that. I'm sure many people think that owner building is a crazy thing to do. Why do it yourself when you can just pay someone else to do it for you? The answer to this is kinda complicated but I'm hoping to explore it in an upcoming post about our own personal war on complacency. Oh and why inflict this owner building hoo ha onto your kids? Hmm... yes why do it to your kids? I have spent many hours wondering if we're inflicting one of those terrible childhood experiences onto our kids that will haunt them into their adult years. And while I still don't know the answer to that, and maybe never will, I think we're all doing pretty well. It would be a lie to suggest that it is all smooth sailing. A house is not built without some tears and setbacks and unexpected challenges. I'd be lying if I suggested that there are not whingey kid mornings and a mother shouting, "Please just go and play!". But I guess the thing is that this is the stuff of everyday life, regardless of whether one is trying to build a house or not. It's true that kids slow things down and while there can be some frustration to this, we try and remain conscious of our guiding vision which is that the kids should be a central part of the process. We've always envisaged this home building shenanigan as a sort of huge family craft project and this commitment has helped us maintain perspective on those cold, windy, whingey, whiney days where it all starts to feel a bit hard. On these days, we end up a building worker down as one of us wiles away the hours close by to the kids eating, swinging, singing, bird watching, plant indentifying, clay pot making, digging, cuddling....And as days go, this is a rather lovely way to spend one. But to be fair to the two O's, they have been pretty spectacular in their enthusiasm and their embrace of the project. They've spent many hours playing happily amidst the building chaos, roaming the land and helping in ways they know how. Olive has developed a penchant for essaying the process through photos and we find ourselves delighted and intrigued by her five-year old's perspective. All the photos in this post are courtesy of the Olive Rose 2012 collection. Soon, very soon we will be living in our little house and in some ways the pace of our life will slow but the life craft project will continue. We've 7 acres to nurture, design, plant, mulch, water, populate with creatures, make edibly productive... and we're expecting that the kids will be a central part of this process too. I'm enamoured by the notion that they experience, from a young age, what it means to be a part of creating something beautiful. Something that is simultaneously beautiful, productive, sustainable and live-giving and no doubt punctuated by the occasional tears, disappointment and whingey whine. I was a little bit thrilled to see that the stones I made for Morag have arrived at their destination and are now hanging out with more than 300 other gorgeous handmade stones. And speaking of crazy-good beautiful loveliness in my life, this week The String Contingent's new CD arrived in the mail, having been lovingly posted to us by our new friend Holly. I kind of suspected it would be awesome when I had a peek at their website and discovered that the band was made up of a fiddle, a double bass and a guitar, and that they were all super-accomplished musicians: I figured the chances of their music being crap were fairly slim. Not only is it not-crap, it is the most perfect soundtrack to our life right now, driving through the countryside, hanging out by the fire in our new tiny farm cottage, wearing a glorious array of hand-knitted oppie finds and enjoying the fog and mistiness of Bega in the wintertime. Furthermore, Olive has declared it to be most suitable ballet music. If you are looking for a similar soundtrack this winter I wholeheartedly encourage you to have a listen. For a while now, my buddies at SCPA have been encouraging us to have a working bee at our place to try to hurry along the progress a little. We've been reluctant, feeling sheepish about moving to a new town and then asking people we don't know to help us build our house. But we're feeling the pressure to get it finished, so we finally succumbed, and last week our little notice appeared in the SCPA newsletter. We're so glad we did! This weekend, 17 friends and strangers and work-colleagues and kiddies came to our place to lend a hand, meet some people and learn some stuff about building kooky little strawbale houses. It was amazing, and we felt so so happy and grateful and relieved at the amount of work we all got done! chatted and ate and felt so so happy to be surrounded by people so willing to come help us out on a sunny winter's long-weekend. Today, Pearlie cooked and I hung out with the kids and sewed up some matching pyjama/tree-climbing pants for Olive, Taylor and Taylor's doll, Isabella. These came about after Tay admired Pearlie's almost-falling-apart pair of 70s purple floral PJ pants that I made for her from an awesomely decorated sheet. I promised that as soon as I found a suitable sheet, I'd make some for the girls too. The sheet came along quite soon thereafter (that tends to happen when you're a compulsive op-shopper/fabric hoarder). Fortuitously, it was orange-themed (these girls love their orange) so we were all set to go. I would encourage you all to have a go at making some sheet PJ bottoms. They're fun and beautiful and pretty good for beginners who want to learn how to copy an item of clothing they already own. If you're interested in a tutorial, leave a comment and I'll post some instructions. After the pants were all done, Oski, Evan and I headed up to the land to try to sort out the major erosion issue that cropped up after the spillway on our dam kind of failed in the rain we had at the beginning of this week. Well, truth be told, the spillway would have been fine had it not been for the fact that a section of the dam wall was actually lower than the spillway. This is not the way it's supposed to be, and what it meant was that as the dam filled (yay!) it actually started to flow over the dam wall, washing out quite a large gully as it went (definitely not yay). Before I worked out what had happened, I thought a wombat had burrowed into the dam wall (that's what it looked like!) but then I had a look at how everything was arranged and realised what had happened. So the first job was to fill in the wombat hole, then build up the dam wall. Tomorrow I'll dig out the spillway so it's the right height. While we were up there I realised, with no small degree of horror, that our water tank was leaking! Just a little drip, coming from where the tap is attached. Unfortunately our giant shifting spanner was too small but a trip to the nursery we got the tank from soon fixed that - the dude there lent me his big wrench! It was a pretty glorious, productive day (my favourite!) and to celebrate, we all went to look at the house we're about to start minding. Yep, it's a crazy beautiful old tiny farm cottage nestled at the bottom of Mumbulla Mountain, with outrageous, panoramic views of the surrounding countryside. We're excited. Today I got an email from a lovely lady called Holly who plays in The String Contingent. 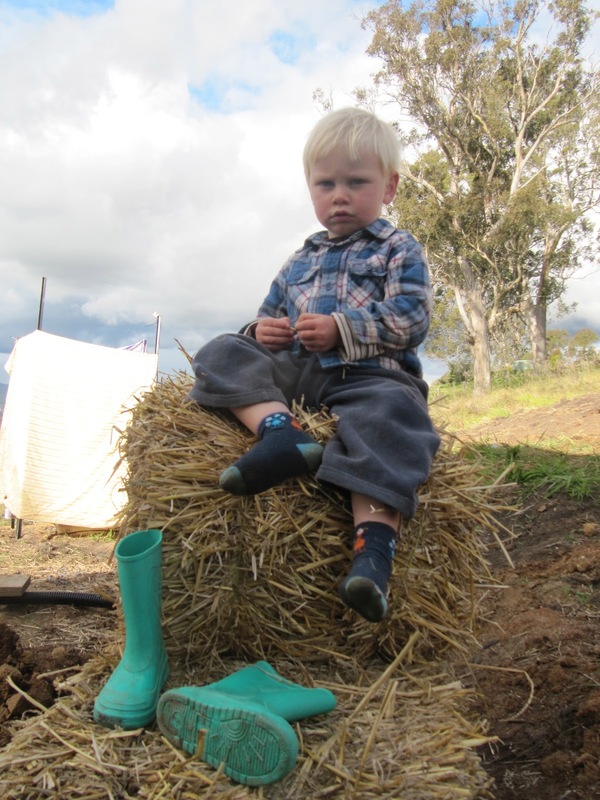 She and her partner are getting ready to submit the DA for their little strawbale cottage, which is to be built in Braidwood. I was so happy to hear from her because a) I like knowing that people are reading the blog and learning from it, b) I quite like answering questions, especially about building, and especially when it's going to help someone else build a totally awesome little-house-of-their-dreams and c) in her bio pic on her web-page, Holly is wearing an outrageously cute Icelandic wool jumper that she knitted herself (!) and which, in addition to being cute is "super warm and somewhat water repellent as Icelandic sheep have developed a special hairy layer in their coat to cope with the harsh winters". Yay, yay and double-yay. In the interests of making our blog a place of learning for would-be strawbale builders, I thought it might be nice to answer Holly's questions in blog form, so others may benefit. Sorry to those of you who read this blog who are not building and/or interested in the minutiae of the building process. Did you have any issues getting the earth floor through council? No we did not! we were lucky, I think, because the Bega Valley has had a long history of hippies moving in and building 'alternative' houses with things like mud bricks and composting toilets and earth floors. Basically, they'd seen it all before, so weren't that fussed. I also spent a lot of time on the phone to the planners at council before we submitted our DA, just getting a feel for what they were like, what they wanted, what they might be a bit 'funny' about etc. They were super nice! And also very helpful, happy to chat through things and tell us what they wanted/needed to get our house built. Did you use a private certifier for getting a construction certificate or did you use the council person? We got our DA and CC at the same time, both through council. We didn't really know what to do, and were tossing up both. I had talked to a friend who was a builder, and he said there were pluses and minuses to both of them. In the end we went with council just because it seemed a bit easier, and they all seemed nice enough and not freaked out by what we were wanting to do. As our inspector told us: "It's my job to help you be able to build the house you want, and to make sure it doesn't fall down on you". Our lovely building designer, Tracy did a crazy amount of work on our DA, basically putting the whole thing together for us. Amazing. She also did our BASIX for us, and I believe that she nominated a slab floor, on the assumption that a concrete slab will perform, thermally, in a similar way to earth. I don't know if this is particularly true, but I also don't really believe that BASIX is a terribly sensible way of assessing a building's sustainability, so don't put too much weight in it. Any particular advice or things you wish you'd known before? Advice...hmmm... Well, at every stage of our building so far I've thought "I'm so glad this is so small! ", so that's my biggie - make the house as small as you possibly can. If you're feeling a little bit funny about living in a small house or wondering if you can do it, read Little House on a Small Planet. It was revolutionary for me. I would also probably look into an alternative for our footings, as ours were very concrete-happy. Holly, I know you're planning on a rubble trench - go you! I'll be really keen to know how that goes, how council is with it, and how it actually works. When you're budgeting, try to get a budget from someone else, and then fill in your own amounts. I had done a rough budget very early on, just trying to calculate costs for all the things I could think of. That was OK, but then my buddy Rebecca gave me a copy of the budget her husband had done for their place. It was so detailed! There was heaps of stuff in it that I hadn't thought of, so I used it as a template and just filled in our quantities and specifications, adding in special things like strawbales, which they didn't have. I also overestimated pretty much everything, meaning that our budget has served us pretty well. I hope this all helps you get your DA together! I remember at the time feeling so stressed about it, like it was the biggest deal in the world. Once the build started though, boy did it shrink into insignificance. Kind of like our HSC: at the time you think it's the biggest deal in the world and if you don't do well you might as well just go and crawl into a little hole and never come out. Then you get into the real world, a few years pass, and you forget all the stuff you learned for the exams, you forget the mark you got, and, when something stressful happens in your life you think "man, if only I was just doing my HSC...". Enjoy the DA process but believe me - things are going to get a lot more exciting once you actually start digging!